So, I stopped wearing a bra. Here’s what I wear to work! Most of the shots are in my bathroom mirror at work, so pardon the faucet in the photos. 🙂 Also, sorry about my iFace. 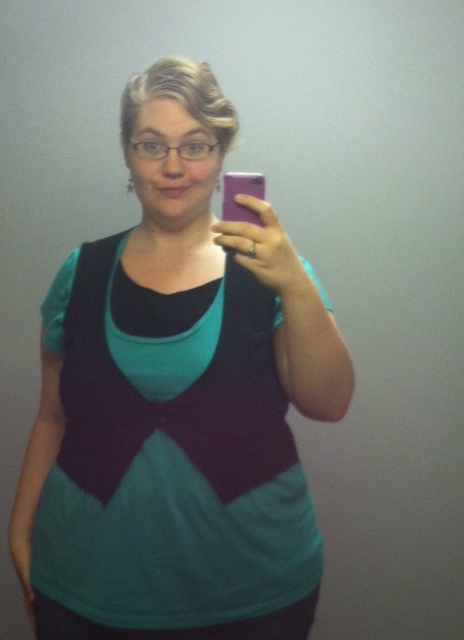 Black tank, green tee, black vest. Layers are the secret to bra-free outfits. 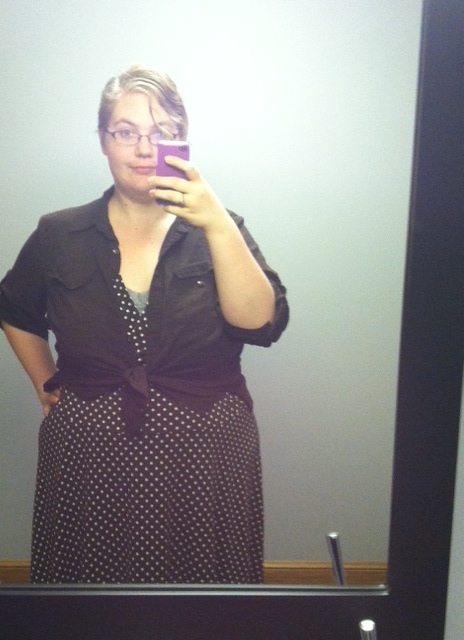 Brown polka dot dress, grey tank, brown button down. Again with the layers. 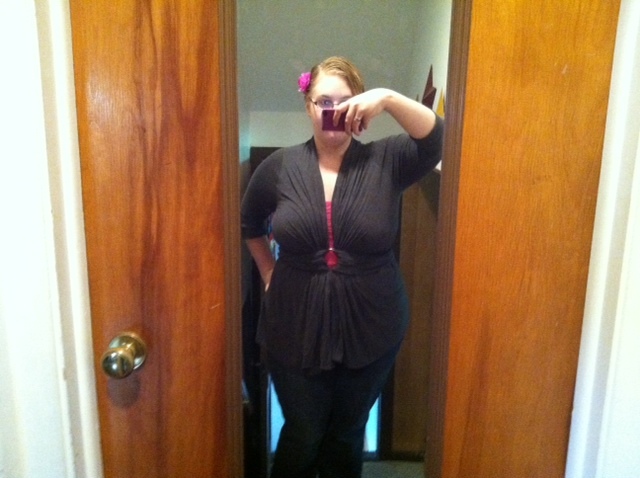 Also, this is one of my favorite outfits! Pink tank, grey button-down. I got the grey top at a thrift store! 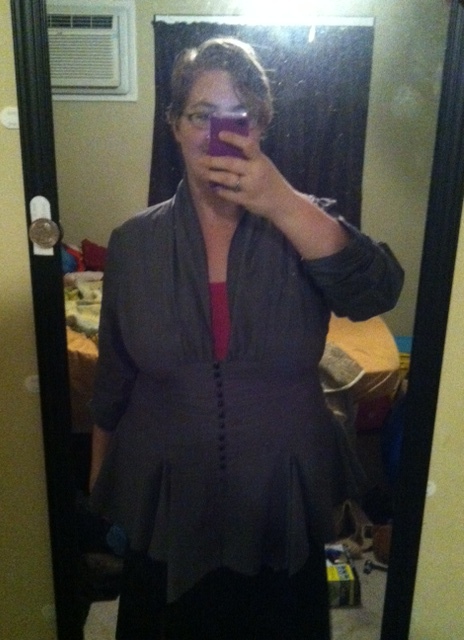 Layers again, plus an interesting bustline on the grey top, it sort of naturally creates a place for the breasts to hang out so they aren’t just all loosey-goosey in my shirt. Pink tank, DKNY Cozy sweater. I remain slightly uncomfortable with this outfit. But I don’t think it’s necessarily that it looks sloppy without a bra, it just really really accentuates my bust, drawing more attention to the chestal region. This tunic top has a bit of an empire waist on it, giving a bustline to the shirt so I don’t have to make one with a vest or other layered top over the shirt. 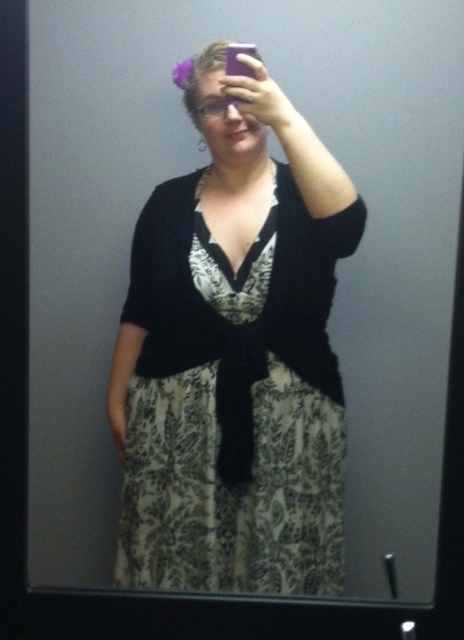 Black and white patterned dress, black cardigan. 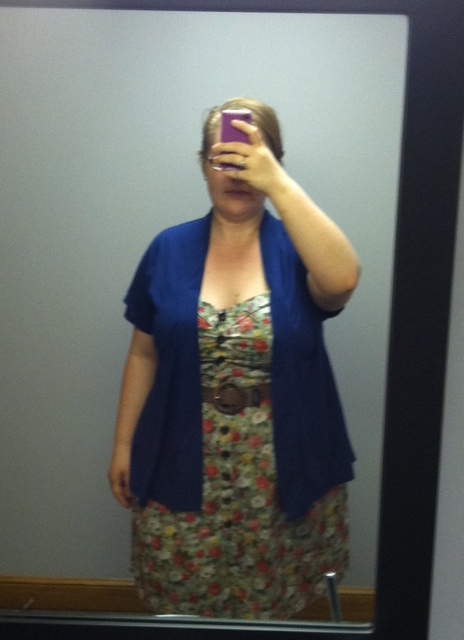 I love this dress so much I had to show it to you with and without the cardigan. 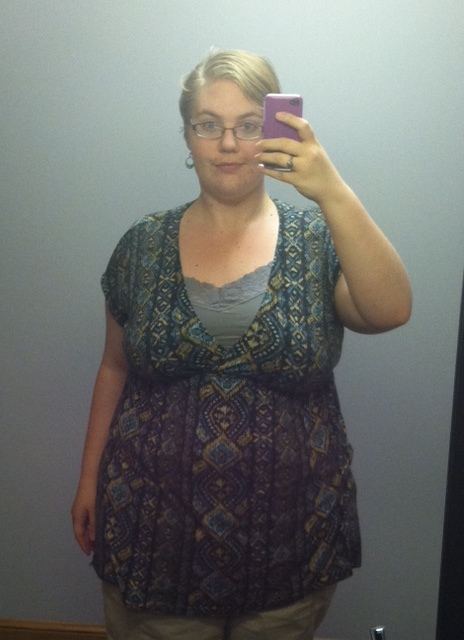 New favorite dress. It has a built in support, so it keeps things in place without really restricting movement or being too tight. Wednesday, October 17, 2012 was Love Your Body Day (LYBD). LYBD seeks to encourage women (and men) to, clearly, love their bodies. Stop fixating on the things you hate about your body. Stop wishing it was different. Stop worrying about numbers on a scale. Stop negative self-talk. Stop reading magazines that promote airbrushed models as the desired shape and size for beauty. Stop letting other people’s words get you down. Here’s a secret: They aren’t always happy with their bodies either. A pants size will not make you happy. To bring this idea around to a practical minimalist application, I’d like to talk about the clothes in your closet, wardrobe, or dresser that do not fit and do not make you feel fabulous. Holding on to clothes that are too big, just in case, is not healthy. You have an excuse to stop being accountable for your health because you think it’s okay since you’ve got a pair of fat pants. First off, stop calling them fat pants. Someone else out there just calls them pants. They may like their body just how it is, and you calling their pants “fat pants” just adds another little layer of insecurity that society is throwing at them. Stick to the clothes that fit you. “But what if I gain weight?” Then you buy bigger clothes when you gain weight. Keep yourself accountable — eat a balanced diet of mostly plants, and move for thirty minutes a day, and you should maintain your weight (minus any health issues that cause extreme weight fluctuations). Holding on to clothes that are too small, as motivation, is not healthy. 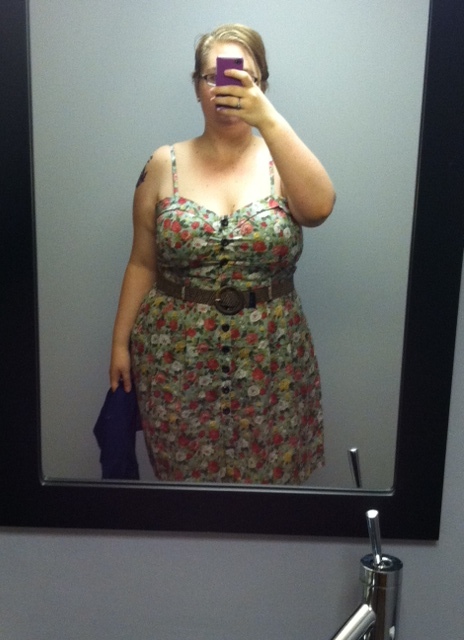 Having clothes in your closet that are too small is a body-negative reminder of your “ideal” beauty and body. Get comfy in your body, and stop making yourself feel bad by surrounding yourself with reminders of what you’re not. If you want to lose weight and wear smaller clothes, do it. In a healthy way. Which will take a while, so go ahead and take that top to Goodwill. Reward yourself with new clothes when you do lose the weight, instead of having to look at a blaring neon sign that says “YOU CAN’T WEAR ME” every time you get dressed. Holding on to clothes that are not your style is silly. These are the clothes that technically fit, but that you don’t wear. Because they have a weird pattern, or you don’t like the cut, or you just don’t wear long sleeved shirts but your aunt bought it for you, or a tee shirt from high school that you have no reason to wear, or any other of the million reasons people hang on to these clothes. If you are not wearing them, get rid of them. Try the hanger trick. Only clothes that fit you and that make you feel good deserve a space in your closet. Anything else is not worth your time. If you are pregnant or otherwise gaining weight that is temporary, a range of sizes is acceptable, but it IS possible to avoid having an entire (soon useless) wardrobe of maternity clothes. See Miss Minimalist for more on that. If you have a lot of clothes in sizes that don’t fit and you can’t bring yourself to get rid of them all, limit yourself to one box of clothes to put in storage for you to have on hand in case of weight fluctuations. Don’t let your mom guilt you into keeping an ugly shirt because she bought it for you. Apply this to whatever guilt-ridden sentimental reason you have for keeping something you don’t really wear. Sorry mom. When purchasing new clothing, look for items made with forgiving fabrics with some stretch, or elastic waists. This makes the clothing more comfortable to move in and accommodates minor weight fluctuations. What’s your favorite item of clothing, and how does it make you feel to wear it? Share in the comments!